We were deeply saddened this week to learn of the passing of Father Ignacio Larrañaga. 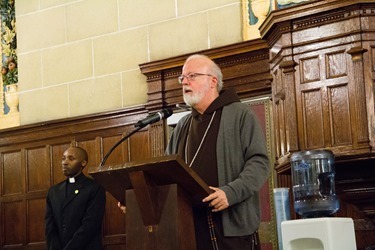 Father Larrañaga is a Capuchin originally from the Basque area of Spain. He was ordained in Spain but, shortly thereafter, went to work in the Capuchin province in Chile and remained there most of his life. He has written numerous best-selling books and is one of most read spiritual writers in the Spanish-speaking world. 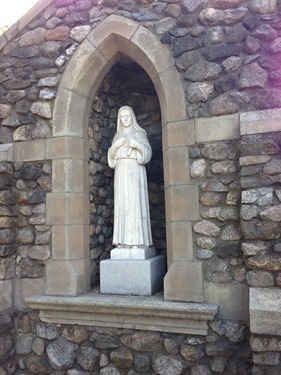 His book on the Blessed Mother, “The Silence of Mary,” is one of my favorites. Beyond his writings, he reached tens of thousands of people personally through his extraordinary “Talleres de Oracion,” workshops on prayer. He travelled all around the world to give these conferences and I would say that, as a retreat master, his talks were attended by more people than anyone else in the hemisphere. I first met Father Larrañaga when I was in Washington. In 1981 I invited him to come and speak for the 450th anniversary of the apparitions of Our Lady of Guadalupe to Blessed Juan Diego. 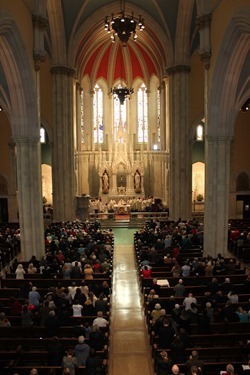 I can still vividly recall the standing-room only Mass he preached at the Basilica Shrine of the Immaculate Conception. 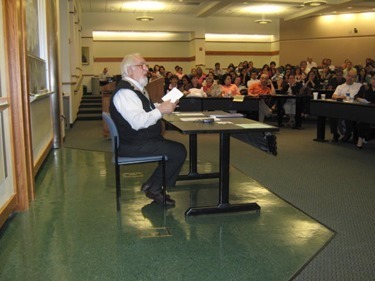 When he came to give a workshop at Boston College in 2009, hundreds of people turned out to hear him, and hundreds more were turned away for lack of room. Father Larrañaga passed away this past Sunday night in Guadalajara, Mexico, where he was preaching a retreat. I was told that the day before he was not feeling well, so those around him suggested that he skip Mass and go to rest, which he declined. 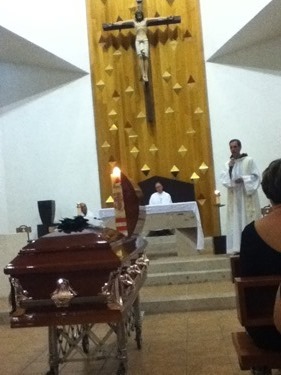 After he celebrated his last Mass, he went to bed and passed away in his sleep. 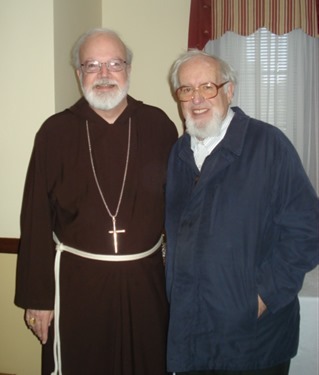 Father Larrañaga’s passing is not only a great loss for the Capuchin community, but for the whole Church. Please join me in praying for him, especially on these Feasts of All Saints and All Souls, when we remember those who have gone before us. We had one of our regular presbyteral Council meetings on Thursday during the day. From there, we went to the Fall Celebration of the Planning Office For Urban Affairs, which is an archdiocesan ministry that works with developers and financing organizations to develop mixed-income and affordable housing in communities throughout the area. During the dinner, they honored architect Bob Verrier, who is noted for his spectacular work restoring historic properties in the Boston area and has done such wonderful work with the POUA. The executive director of that office is the very able Lisa Alberghini. Under her leadership, hundreds of units have been developed for low income families and individuals. Since its founding, the office has provided for the development of over 2,600 units of housing for over 11,000 people. That evening, I attended the Adopt-A-Student Foundation Dinner of Cathedral High School. Cathedral High School serves mostly low-income minority and immigrant teens, and is able to carry on its very important mission because of the wonderful Board of Trustees and the many alumni who are so generous in their support of the school, improving facilities and providing the young men and women with scholarships. This annual dinner is a very important part of that fundraising effort. The beautiful thing is that, to a great extent, the support of the school comes from people who were the children of working-class families who attended the school a generation ago, gone on to be very successful, and are now sharing their blessings with this generation of students. A student and a former student always speak at the dinner, and it is an extremely moving experience to see these young people and understand the impact Cathedral High School has had on their lives. 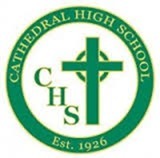 In a demographic where many do not even finish high school, students at Cathedral High not only finish high school but nearly all of them attend college and go on to lead very fulfilling and productive lives. 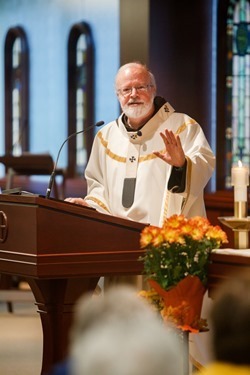 Friday, we celebrated the funeral Mass of Father John Hannon, who was much beloved. 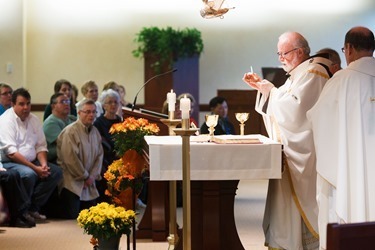 There was a Memorial Mass at Father Hannon’s parish on Wednesday, with over a thousand people attending. The Funeral Mass on Friday at St. Patrick’s in Watertown, his home parish, brought about 70 priests, and the church was filled. 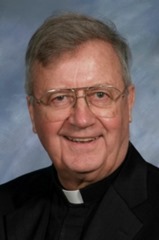 It was a beautiful tribute to this extraordinary priest and Father Tom Nestor gave a very moving homily. 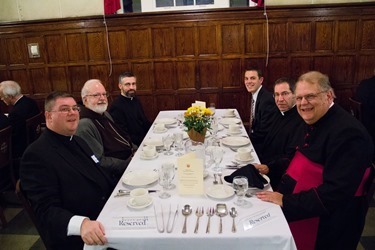 That evening, we had the annual Alumni Dinner at St. John’s Seminary. 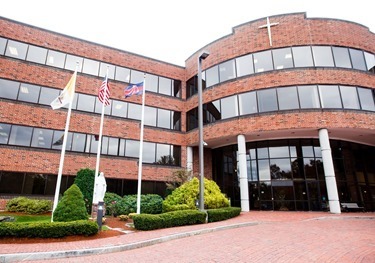 It is a wonderful occasion to welcome priests, not only from the archdiocese but throughout New England, who return for this opportunity to be at the seminary for holy hour and dinner. At the dinner, Msgr. Moroney updated the men on the wonderful progress the seminary is making. 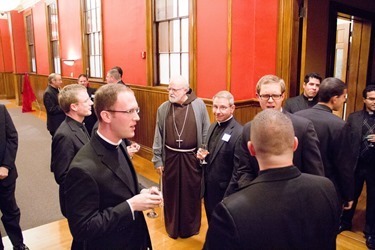 I am always very happy to see the cross-section of generations of priests who attend. In my comments to them I mentioned how, to my mind, it is great value to have a seminary that can train priests not only for our own archdiocese but the whole region. 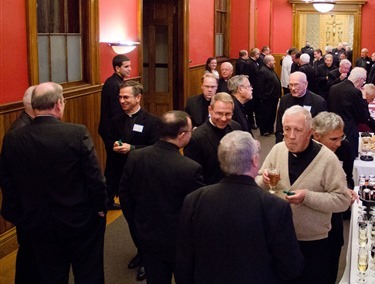 This allows priests the opportunity to have these priestly friendships with men who are working in the Church throughout this part of the country. 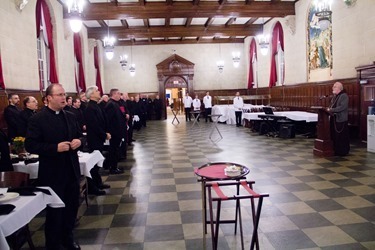 The dinner concluded with a musical selection played by two seminarians, Stephen Poirier and Stephen Lundrigan. Saturday, I traveled to Ste. 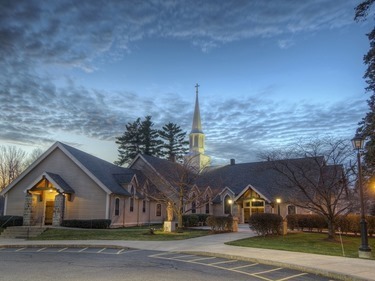 Marguerite d’Youville parish in Dracut to celebrate Confirmations. Father Marc Bishop is the pastor there and is doing great job. I am always very happy for the opportunity to be with young people at this very crucial moment in their lives, when they are receiving the sacrament and rededicating themselves to the vocation of faithful discipleship in the Catholic Church. After the Confirmation we went with the staff and had lunch at Saint Rita’s in Lowell. 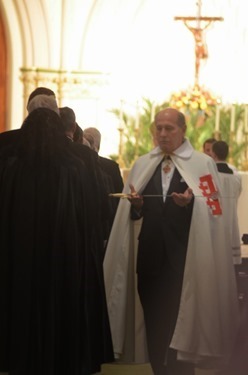 That evening, I was in Manchester, New Hampshire for the installation ceremony of the Equestrian Order of the Holy Sepulcher. 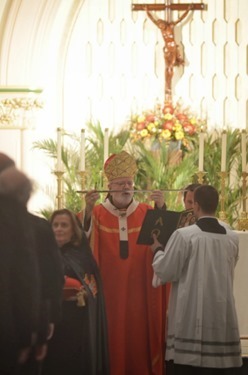 As the Archbishop of Boston, I am the Grand Prior of the Northeastern Lieutenancy. The order has existed for 800 years. 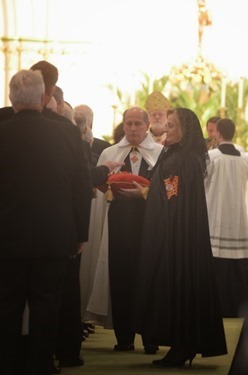 Its particular purpose is to support the works of the Church in the Holy Land and caring for the sick. 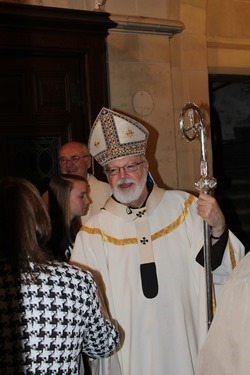 There were a number of other of bishops from the region who attended the Mass and we were all very happy to also be joined by the Archbishop of Québec, Gérald Lacroix, and two of his auxiliary bishops. 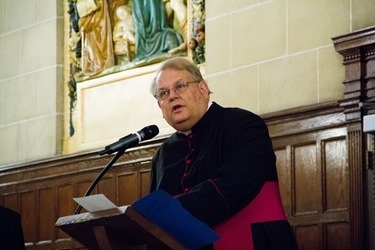 Archbishop Lacroix is originally from Manchester and his family still lives there. 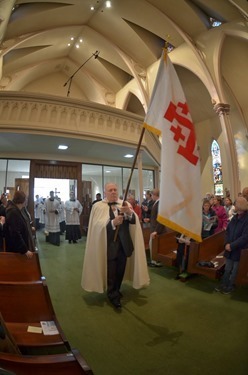 On Sunday I was at Gate of Heaven Parish in South Boston for the Mass to celebrate their 150th anniversary. 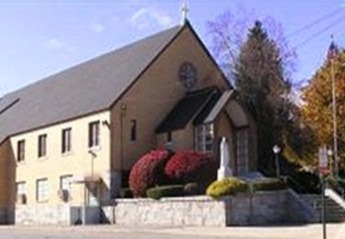 The parish was established during the Civil War and then, shortly thereafter, came the Potato Famine in Ireland. It was, in many ways, sort of an apocalyptic time and it was in that time of turmoil that the hopeful sign of this new church came. I preached from the pulpit, which I understand doesn’t normally get much use. (They prefer to preach from the ambo.) But I told the people that there was a great view from up there and I was happy to be using the magnificent pulpit that the church has! 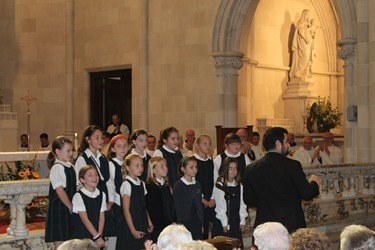 There were a number of Sisters of St. Joseph there, for 100 years they worked in the parish. 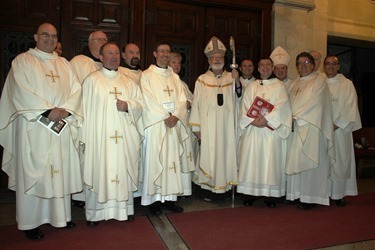 We were also joined by many priests, those who had been stationed at the parish or were from the parish themselves. 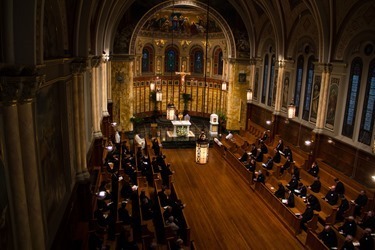 Of course, that parish has produced many vocations for the priesthood and religious life. It was a very happy celebration. After the Mass, Ambassador Ray Flynn, who is a native of the parish, gave a short reflection on his experience growing up in the parish and what it meant for him personally. 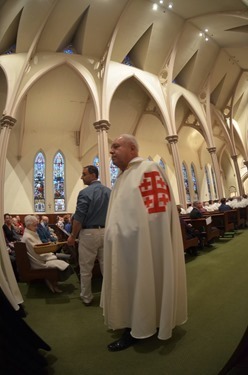 He also pointed out a number of longtime parishioners from the parish. 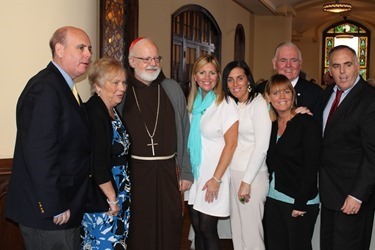 Of course, we are all very grateful to the priests who have served there, including the present pastor Father Bob Casey, who has done so much for the parish. 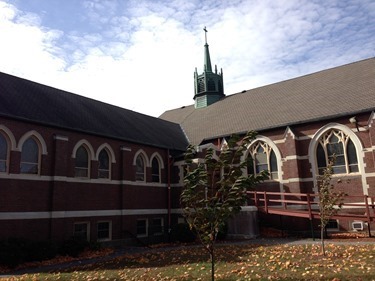 That afternoon, I visited St. Monica parish in Methuen to celebrate Confirmations with them. About 70 young people Confirmed. 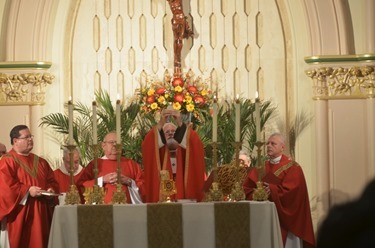 The pastor, Monsignor William Fay, has only recently arrived in the parish to head one of the new collaboratives in the archdiocese and, so at the end of Mass, I formally installed him as pastor. On Tuesday, I also celebrated Confirmations, but this time the setting was a bit different. We were at MCI Norfolk. After the Mass, at which 8 men were Confirmed, I visited some of the men in the infirmary and then had a chance to meet briefly with the administrators. 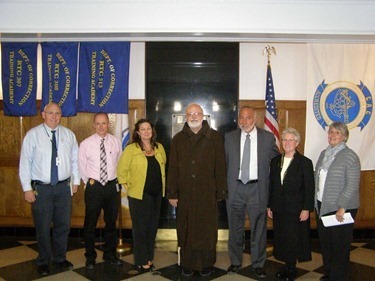 Deacon Jim Greer, our director of Prison Ministry accompanied us there and we were also happy to be joined by Monsignor Peter Conley who is the local pastor and the prison is within his parish. 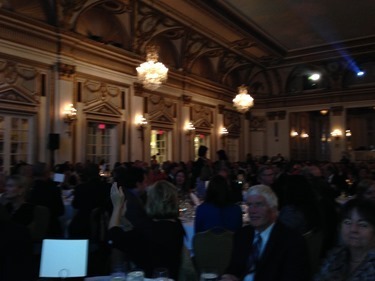 Wednesday, I attended the Diamonds of Dorchester gala to benefit St. Mary’s Center for Women and Children. They provide work programs, educational opportunities, housing, and after school programs for families, women, children and teens living with the effects of poverty and trauma. During the evening, they honored Blue Cross Blue Shield for the support that they have given to the center. 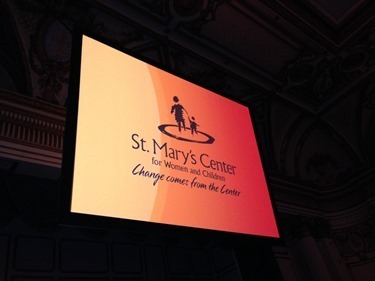 The evening featured a conversation with Mayor Menino and the former president of the center, Judy Beckler, during which they spoke about the history and mission of the center and reflected on the important work that has taken place there. It was also an opportunity for them to introduce Deidra Houtmeyers who will be taking over as president. Two former residents spoke and their remarks were very moving. Liz Walker did a fantastic job as emcee, as always. She is so generous in being willing to emcee for many different Catholic events. 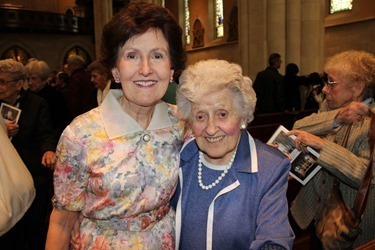 As many of you know, she worked in the Boston television news industry for many years and now is a Presbyterian minister. She promised that she would have everybody out by 8:30 so they could watch the Red Sox win — and she was true to her word! I did make it home in time to see the end of the game. Though I have to confess I had been checking the score my on phone — and I know I was not the only one! I want join everyone in Boston and throughout Red Sox Nation in commending the team for their World Series victory and thank them for bringing joy to a city that has experienced such tragedy this year. 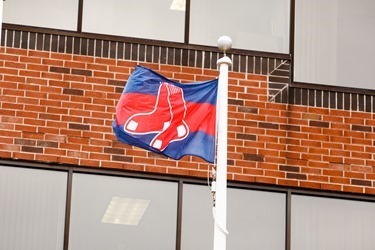 We even have a Red Sox flag flying outside the Pastoral Center in appreciation. 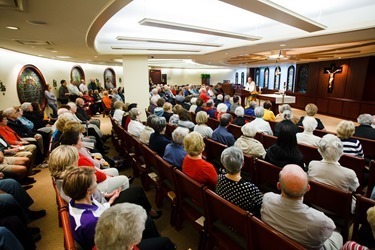 Of course, today is All Saints Day and I celebrated the Mass here at the Pastoral Center. All Saints is the day we celebrate, not only the holiness of our canonized saints, but also the “unknown soldiers” who are in God’s presence interceding for us. As we move into the month of November, it is a time that the Church holds up for our awareness and prayers for those who have gone before us marked with the sign of faith, those who are in the Church Triumphant — those who live in glory, and those who are in the process of approaching their destiny with God.